Collins has performed with Beyonce, Michael Bolton, Jill Scott, Nick Lowe, Gloria Gaynor, Train, et al. She’s performed on the Today Show, Oprah Winfrey, Late Night with Jimmy Fallon, at the White House for President Obama (twice), The Rachel Ray Show, The View, The World Music Awards, the Black Girls Rock Awards on BET many times, Ellen Degeneres, the Grammys (and many others),in addition to appearances at several international jazz festivals. Collins boasts two recordings as a leader, to her credit. Innova Records said about her debut recording, “Here With Me” that “Kiku puts a flugelhorn to her lips and animals come to listen, it’s so sweet.” Her newest recording, “Red Light” showcases her unique abilities as composer, performer and producer and includes notable guest performances by Michael Lington and Al Chez. A third album is officially in the works. Collins is also a cancer and lymphedema patient, and is actively involved with #Cancerland and other advocacy organizations. Until we have a cure, we have each other. Brass Chicks: From working with Beyoncé to appearing on TV and in the White House, you are no stranger to high-profile gigs with and for important people. How do you manage your nerves and stay calm on stage during these performances? Kiku Collins: I make sure that I’m prepared as much as possible. Learn the music inside and out, warm up, hydrate, and go from there. One of the biggest lessons I’ve learned along the way is this – if I feel nervous, I tend to screw up. I like to use the energy in a more exciting way. I like to think of all of the people out there who are excited to hear music! And, I get to make some of it for them! What a privilege. Enjoy it and create happiness! I remember after my first White House gig, one of the band members congratulated me on one tune that I started on my own – out of the blue. He said he sat there nervously waiting for me to start, and breathed a sigh of relief when it came out right. I laughed at him and realized how funny it was that he was more nervous than I was. What I did was blow air through my flugel, which was cold at the moment, sing my first note in my head, and realize that I’d done it a handful of times during rehearsals without a problem. I was still a bit tense since I had no reference note or rhythm, only a very quick and quiet countoff, but The Obama’s were sitting mere feet away from me, waiting! What an opportunity! BC: Your resilience through various health issues with cancer is unbelievably inspiring – especially through your work with Cancerland, LympheDivas, and more. It is impressive that you are able to maintain a public profile and continue to perform while undergoing these issues. How do you stay positive and motivated? Do you have any advice for those of us trying to increase our mental toughness and continue to push through difficult times? KC:I’m not sure about mental toughness. I don’t often think about becoming tougher, but of course, I’ve been on the planet for a while now, as a female trumpet player – so that’s something that has helped me with my immunity to mind games that some people like to test you with. I think life throws stuff at us, and we do with it what we choose to do. At times, I want to give up, but that would mean death – physical, career or emotional. I have too much to do! I’ve had adaptive devices created, I’ve had to learn to do all sorts of crazy things to keep my arm under control, to stretch out my scars, etc. I actually kept my cancer a secret from the industry for 6 months. When I realized that I wasn’t going to drop dead immediately, I knew that I would eventually be telling people. I made it my mission to inspire others with similar challenges. BC: Do you see any specific challenges for musicians in today’s climate? How do you mitigate those on your own or when teaching? What about as a female brass player? KC: I see challenges for musicians period. I’m not sure I can be more specific than that. It’s always been, and always will be, an ever-changing field, I’ve gone from small clubs to recording for television to touring and television appearances, and recording for other artists and myself. I persist because I have a passion for the work and because, as my friend Eddie Pazant always said, “Life is to be enjoyed.” We can’t get back the time we waste on negative emotions. I try to enjoy myself, no matter the gig. BC: What do you have coming up? What are you looking forward to? KC: I have life coming up! I look forward to living! In addition, I’m doing some concerts for an NYC non-profit called Music For Autism, which serves the autism community. I’ll also be doing some touring with Gloria Gaynor, including a Disco Cruise! BC: Is there anything you wished you had known as a student or young professional that you know now? Any advice that you’d like to share with younger female musicians? KC: Relax. I’m still trying. The only time I seem to get real rest is ironically on tour – if I have the time – because I don’t have errands or housework or paperwork with me! The show must go on. If, say, the monitor man or woman starts hitting on you, you have to make a decision at that time. How will you handle it? You need that person to work with you, you need to work with them and communicate your sound needs. I always find it best to be professional and laugh it off as best you can. Hopefully, they will simply back off and laugh with you. If not? Explain to them that you’re there to work, but that you appreciate their admiration. Some may disagree with my methods, but it has served me well over the years with crew/sectionmates/bandmates etc. And it’s always best to have no hurt feelings when you’re trying to create art together. But, if things escalate, reach out to someone you trust to help out. And, never let that experience ruin your gig. Realize that the person is weak, and that you’re the one in charge. Memorize as much music as you can. I get to dance a lot on gigs, and I love it! But, even if you’re standing still or sitting, you never know what light situation, or surprise smoke machine, or burnt out lightbulb or battery halfway through the gig, might find it’s way into your set. I love using an iPad on gigs, since they’re perfectly lit. But, the battery can die if you’ve gone through a long soundcheck and forgot to plug it in while you were changing and grabbing a bite! Plus, if you have the music in your head, and you take your eyes off of the page, you can make that music your own, and add so much more of your flavor to it. You can use your eyes with the audience, or other band members, or the monitor person if you need help on your sound situation (as long as that person wasn’t hitting on you and now it’s a little awkward!) You can close your eyes and give your other senses a power boost. Know how your body reacts to certain foods/drinks. I always like a bottle of coconut water on stage with me. I know that too much salt or any alcohol are counterproductive for my face. I’m allergic to wheat, but before I realized how bad it was, I would always try to avoid it before a gig anyway, since I did notice that it didn’t make me feel good. I am fine with sparkling water, but not everyone is. Red meat wakes me up and my brain works better on stage. Tomatoes sometimes irritate my gums and tongue. Fruit is always good for me – especially watermelon. A little bit of coffee or caffeinated tea before the gig seems to help, but a lot doesn’t! Start taking notes if you need to. Learn your body. Exercise and eat right – strong and lean is key for me. Luckily, I learned this one early on, but I’ve let myself fluctuate quite a bit over the years. And when my body is leaner (and even 5 lbs affects me negatively), I can breathe much better. I’m more comfortable, and feel more powerful physically and mentally. I can move more easily, and am literally lighter on my feet. It’s amazing what a difference it makes! People talk about the “tone chamber,” but personally, I have way more power when my tone chamber is lean! BC: Any resources you recommend? Books, podcasts, recordings that changed your life etc. KC: Listen to everything you can. It’s so much easier now! I used to get my Columbia House cassettes and cd’s in the mail, listen to the radio, and really hear every part that I could. My two favorite books currently are The Talent Code and The Four Agreements, when it comes to music. There are so many that I love, but I always come back to these (I also recommend the audio books in addition to paper, as they’re great to listen to on the road). Recordings are ridiculously numerous, but Birth of the Cool was a favorite of mine all through high school, and remains so today. There are many other super cliche recordings on my list, but I highly recommend listening to Zappa. I have tons of it and am always surprised when I shuffle through and hear the diversity and color pallete in his work. 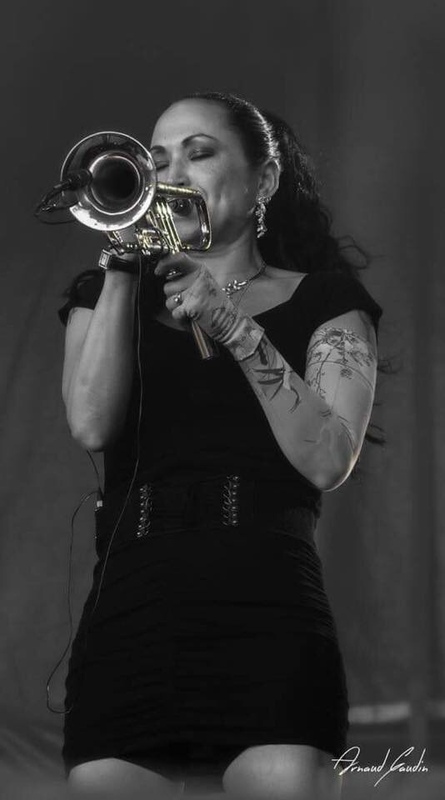 I’m not a traditional trumpeter – 2 of my biggest influences in music were Pat Benatar and Annie Lennox. I loved hearing strong women. And yes, I still listen to them. I don’t have the time to list all of my influences, or what inspires me. Sometimes I hear music that is totally new to me and I start hearing parts that aren’t there, or I rewrite them in my head for fun. Music is malleable and should flow. At least, it does in my brain.